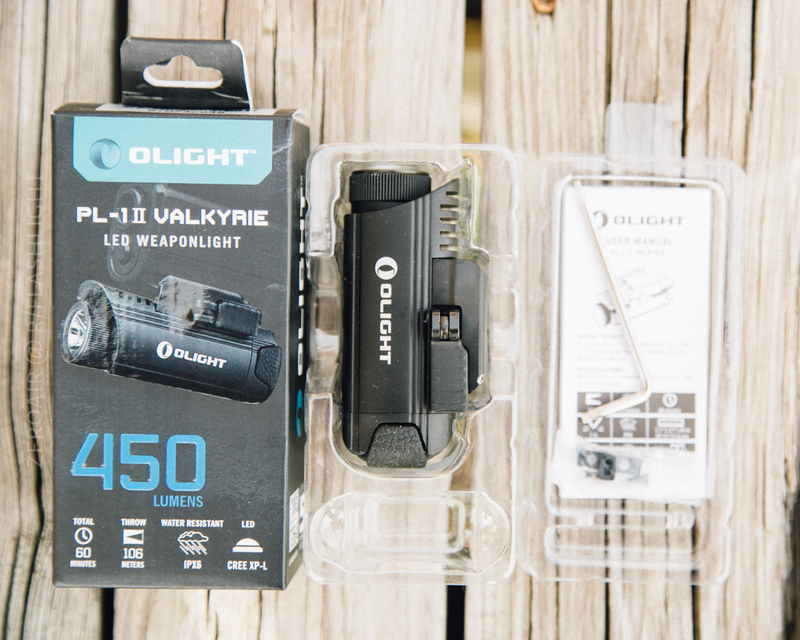 Olight sent this PL-1 II Valkyrie weapon light for review – it’s the first gun light I’ve reviewed. 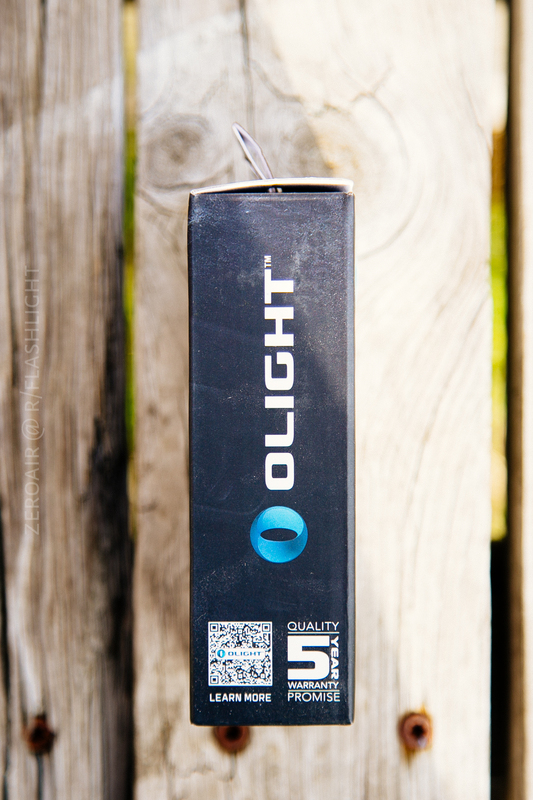 Thanks to Going Gear for facilitating the exchange and thanks to Olight for sending out the review unit! This is the updated version of the PL-1 Valkyrie. 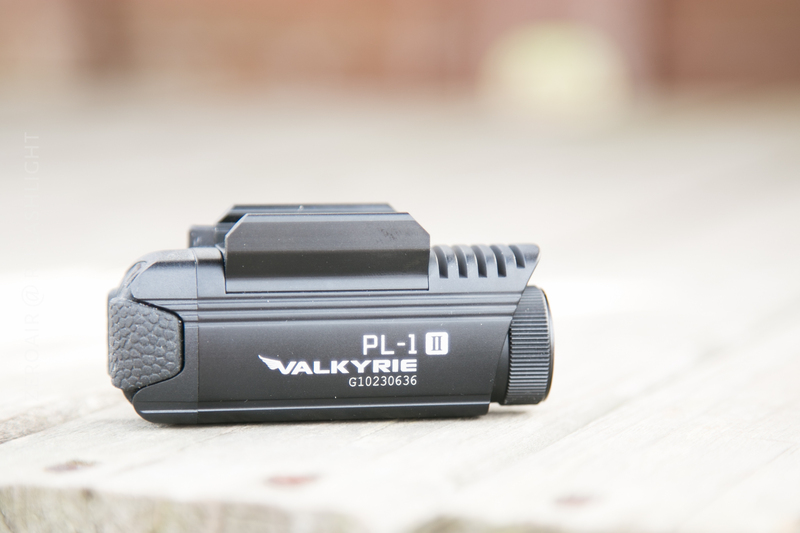 This version, version II, has more lumens (450 vs 400), a new UI, and a sturdier locking mechanism over the first generation Valkyrie. It fits on my gun just fine, it holds up to round after round, and puts light in the right spot. I call that a win for a gun light. Photo album and some beamshots. 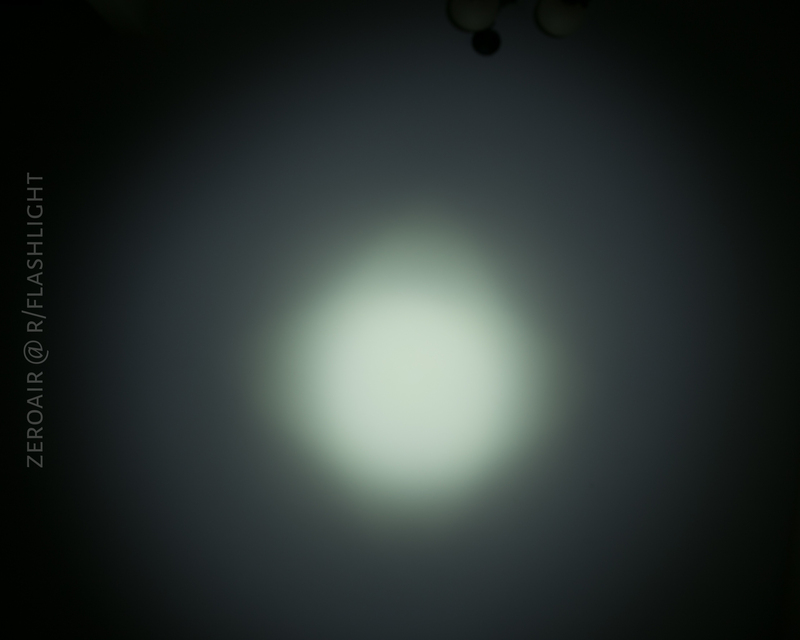 There’s just one mode, so… yeah, just the one beamshot. But hey. It’s a task specific light. Here’s the runtime on high. this light too, like it’s done most other lights lately. contains all the needed information, including the UI, how to insert a cell, and how to install this light on your weapon. It’s a simple manual, as it should be. This is a very specific-use light. Manual, back page. I found the build quality of the Valkyrie to be good. During testing, I did drop the light rather hard, and one of the corners took some abuse. But the Valkyrie did withstand 100+ rounds from being mounted on a 9mm 115gr ammo. So the build quality and durability go get good marks from me. The threads on the head are just like the girls I dated in college beefy, square, and shallow. They have a nice amount of lube, and unlike most other unanodized threads, I never really felt like I was about to cross thread them any time I used them. So it may be possible to disassemble the light, but I won’t call it easy. There are also some thick, deep cooling fins on the top side. Only one end of the battery compartment has a spring. Note that I have not seen any pressure switches for this light…. So it’s likely strictly to be used near the trigger guard, and not much past that – i.e. it’s not going to work on longer guns, unless you’re using your non-trigger hand to activate the light. This is a CR123A light, but it’s built to withstand a bit of abuse. 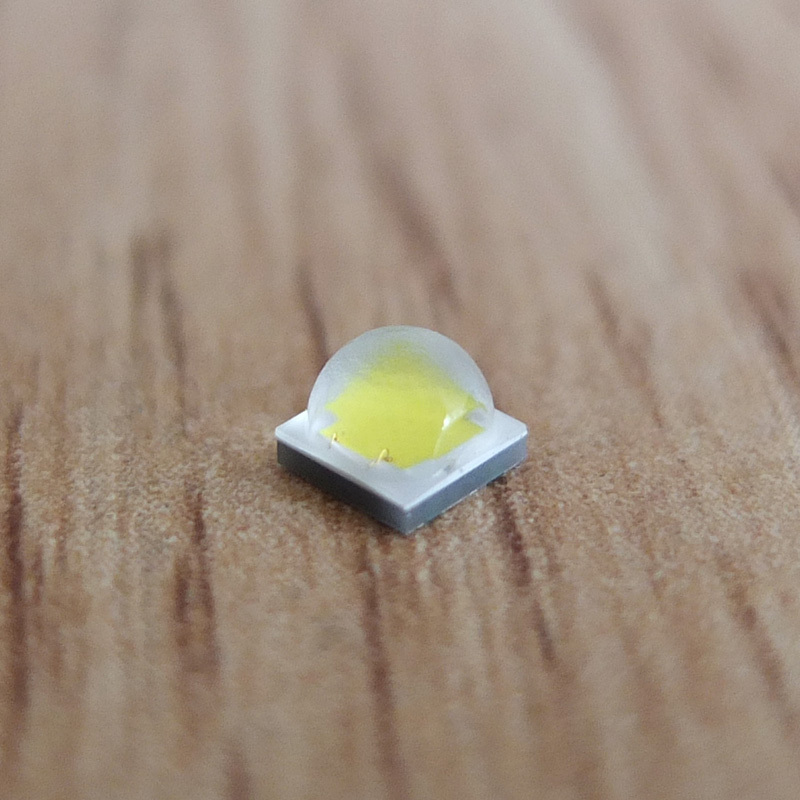 At 1.22″ x 3.07″, it’s bigger than many of the current CR123A lights. However, it’d likely going to reside on a weapon, where pocketability may matter much less. Having said that, the Valkyrie protrudes a fair amount (appx 1″) on my 4″ barrel 9mm, a Walther PPQ. It’s still usable, and that’s what I shot it on, but having the light so far forward of the barrel does cause quite a bit of fouling on the lens, and will need to be maintained. In fact I’m not sure I’d see this as a good long term use for the Valkyrie. Plan to use this on your 5″ barrel handguns. is shipped installed, but I can say that this mount fit my Walther PPQ very firmly too. Those screws are Torx screws, and Olight includes a Torx wrench for swapping the rail mount. That’s it for this weapon light. I have from another light worked in the Valkyrie. It’s strictly a length issue though – all the other 16340’s I had were a solid 1-2mm longer than the Olight branded cell. In my two runtime test, I found the termination voltage to be 3.41V and 3.19V. This did not seem to be a timed voltage shutoff, because the light will in fact not operate below those voltages. The runtime tells what I think one would hope a runtime tells for a weapon light. The light stays at very near it’s highest level for the duration of it’s 30 minute runtime. The temperature does not seem to be regulated, and the light got quite warm, but that won’t be a problem since the light won’t be hand held (and the temps didn’t get into the dangerous territory for the cells/emitter). 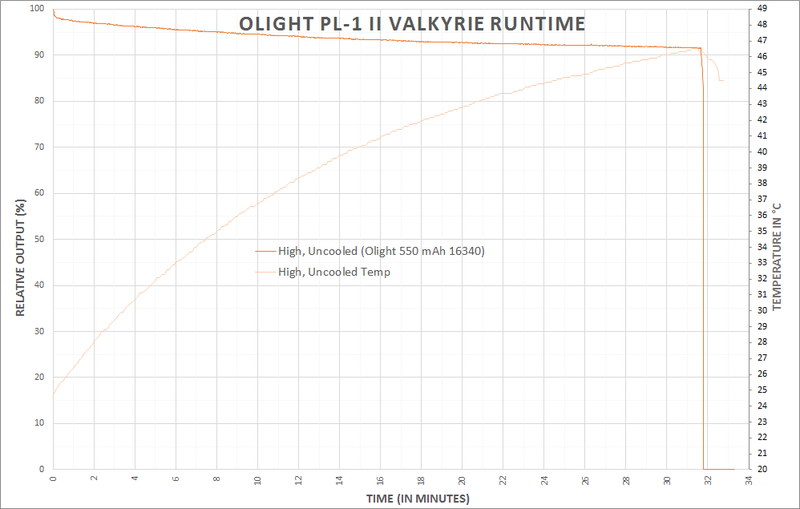 Note about the runtime – since the light is meant for primaries, and primaries typically have twice at least, the capacity of rechargeables (and this one was just 550mAh), I have no doubt that the Valkyrie will reach the claimed 1h of runtime. I’d be interested to see what the temperature did if left on for that long, however. on the Valkyrie – designed to fit around the trigger guard and be accessible for right and left handed shooters. These switches have identical use, except when they’re used in unison, and in that case, they activate strobe. That’s it, really. There’s not much to the UI but that’s a good thing, because in high stress situations, there’s less to fiddle with and screw up. 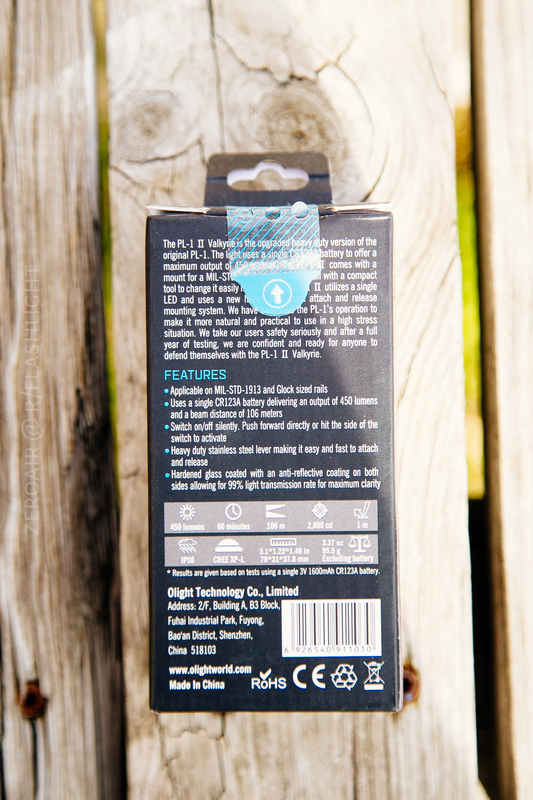 The switches are very tactile – grippy and raised enough to be easily noted while a weapon is drawn. They’re also clickable from multiple angles, so no matter how you come at them, you can activate the light. This light features a Cree XP-L emitter. The beam has a nice hotspot with a fair bit of spill. The reflector is smooth, allowing for maximum throw from this domed emitter. There’s nothing bad about the beam profile, particularly for this use. The tint is a little… off for my tastes – very cool. But for maximum lumens, cool is good. – it’s not completely domed, and those flat sides (as you can barely make out in that photo) make the beam shape this way. There’s a beamshot on the only output level. Streamlight has a bunch of very similar models. Some have TIR optics (which I like and think would be a bonus in this application) and some have laser mounts, etc. One thing that irks me about the Streamlights – the emitters are labeled as “C4 technology”. IE, Streamlight isn’t telling me what emitter is in their light. I’d rather go with a known emitter that might be not the latest emitter, than a complete unknown. Of course internet searching can reveal the emitter being used in most models, but I want the company to state it themselves. 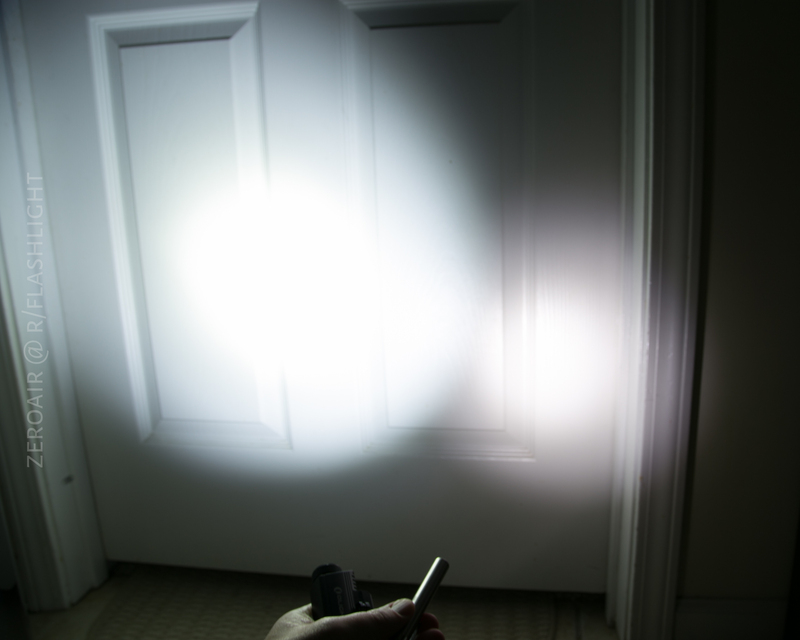 Surefire also makes at least a couple of similar lights (X300 for example). Surefire has a great reputation, and you’ll pay for that – the Surefire options are all at least twice the price of this Olight. Both of the competition listed here uses paddle switches on their lights. Though I haven’t shot with a paddle switch light, I think that might be more precise than the rubber boot buttons on the Olight. 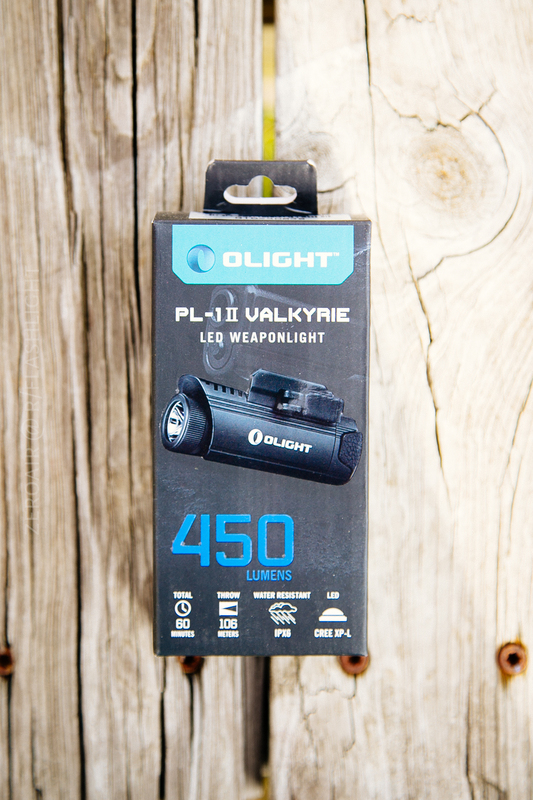 For a 5″ long barrel handgun, I think the Olight PL-1 II Valkyrie is a great choice. For 4″ barrel handguns, the Valkyrie is still good, but be aware that the light will protrude past the barrel. This is a nice-price functional weapon light, that has held up to the abuse I’ve put it through, and I can easily recommend it. Thanks to Olight for sending this light, and to GoingGear.com for facilitating. ← Convoy L6: A Merry Christmas Flashlight Review!